In stock - low quantity. Order in the next 5 hours, 23 minutes and it will go out today! 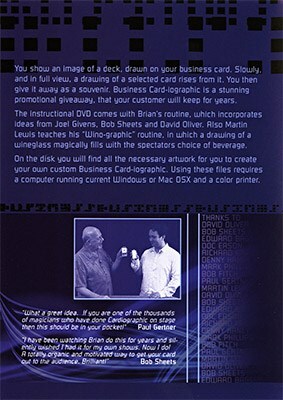 The instructional DVD comes with Brian's routine, which incorporates ideas from Joel Givens, Bob Sheets and David Oliver. Also Martin Lewis teaches his "Wino-graphic" routine, in which a drawing of a wineglass magically fills with the spectators choice of beverage. 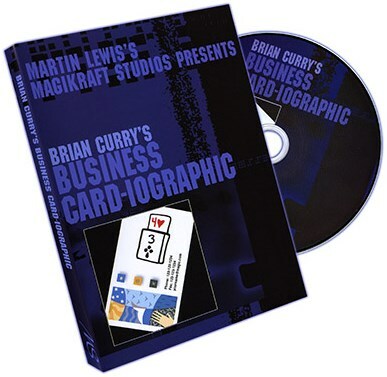 On the disk you will find all the necessary artwork for you to create your own custom Business Card-iographic. Using these files requires a computer running current Windows or Mac OSX and a color printer. "What a great idea. If you are one of the thousands of magicians who have done Cardiographic on stage then this should be in your pocket!" "I have been watching Brian do this for years and silently wished I had it for my own shows. Now I do! A totally organic and motivated way to get your card out to the audience. Brilliant!"